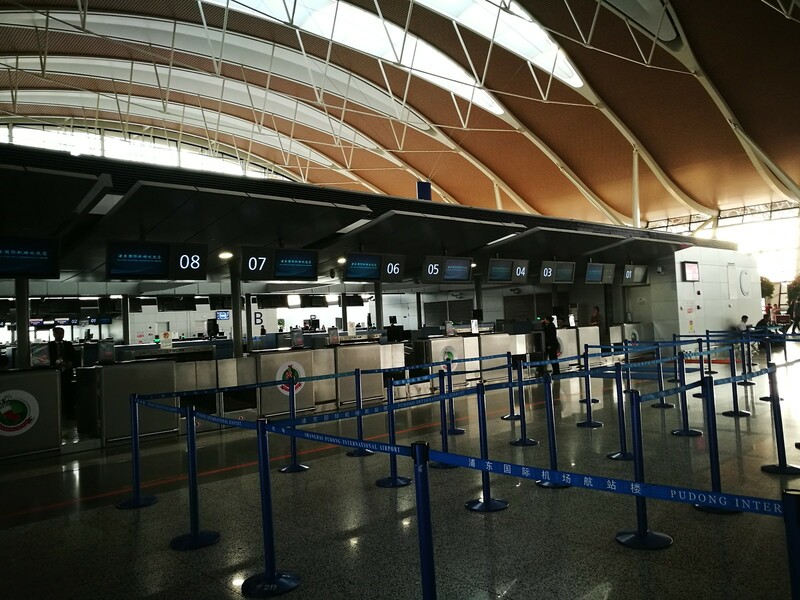 For this flight departing on New Year’s Eve I arrived slightly late in Shanghai Pudong Airport Terminal 2, and was one of the last to check in again at the empty counter. Upon checking in, I noticed my seat assignment was switched to the emergency seat row due to some faulty seat on my original selection, according to the check-in agent. Since I had been assigned an emergency exit seat row with a window, it was an ‘upgrade’ from the normal seat in my opinion. Past immigration, I was able to go through a closed off security booth due to the close boarding time by showing my boarding pass to a staff member. Having arrived slightly more than an hour prior to departure time, I made it in time to the boarding gate as they were boarding the last group of passengers. This meant there was no queues and I casually strolled into the plane even with time left to capture a few shots of the plane. I must have been very fortunate for this flight. 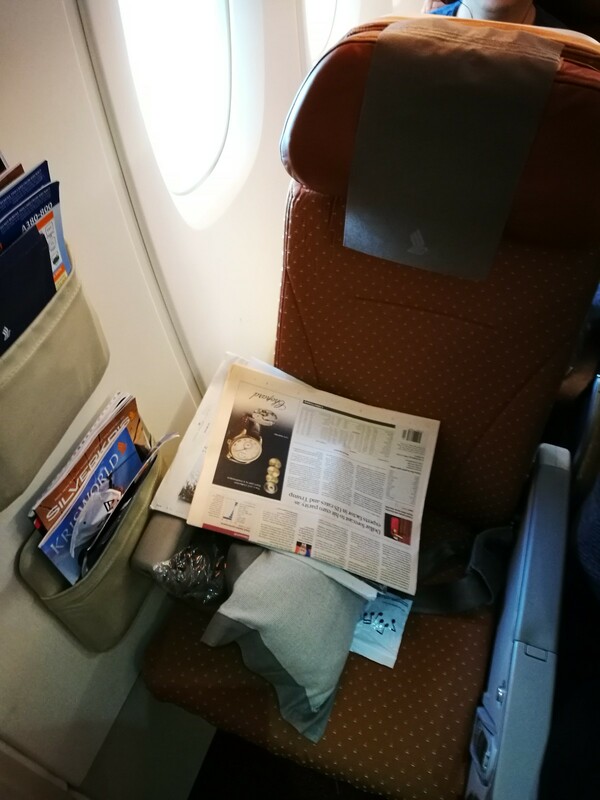 Before stepping into the plane, I noticed newspapers were available by the jet bridge, and this was the usual for Singapore Airlines. Not only was Singapore’s national newspaper ‘The Straits Times’ supplied, but so were a variety of Chinese newspapers and dailies like Financial Times and WSJ. Onboard the A380, Economy class was in a 3-4-3 configuration on the main lower deck, but it has one of the most comfortable Economy class configuration. Singapore Airlines is also generous with amenities as a pillow, blanket and headphones were placed on each seat. Upon settling down, the crew started offering hot towels and menus for the flight. 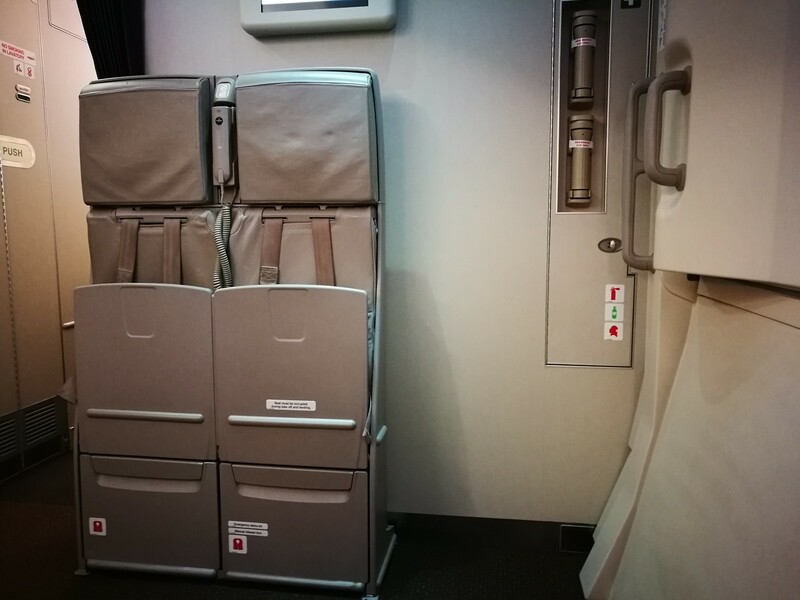 As one of the last few passengers to board, the cabin was more or less full but I was lucky once again to get the middle seat empty and with lots of legroom on the bulkhead, I was comfortable even in Economy class. 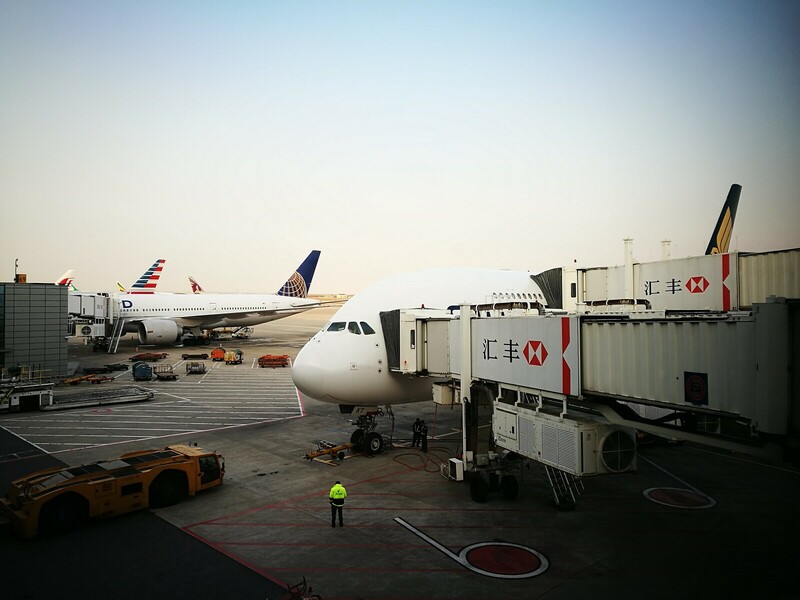 Being the last few passengers to board, there was not much waiting inside the plane and very soon the plane pulled out of the gate towards the runway. Surprisingly we were up in the air in no time, and there was not much wait on the taxiway at all. At cruising altitude, I extracted the inflight monitor from under the seat and it seems the KrisWorld entertainment system has been refreshed to the latest system to be closer to that of the new A350. 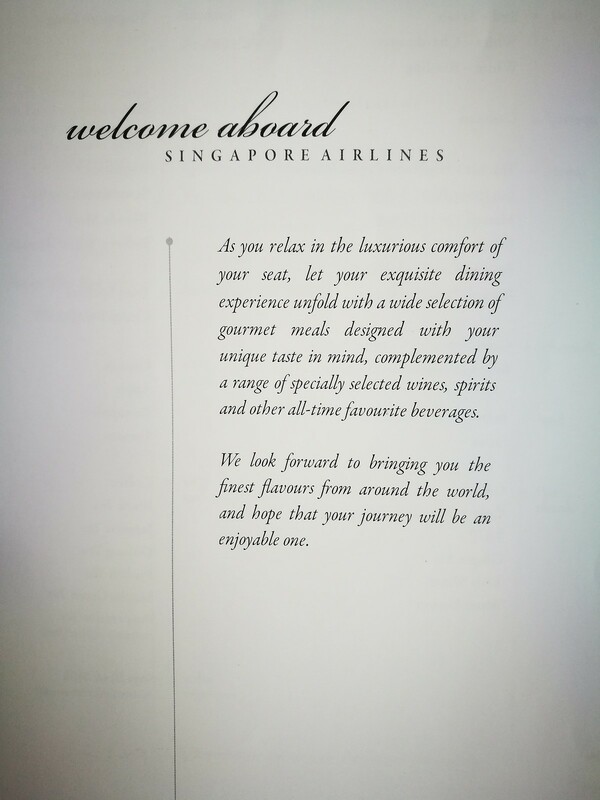 This was a nice touch and I am always keen to catch some TV shows or movies onboard Singapore Airlines with their great selection. The fact that their menu and interface are so intuitive to use makes it a seamless experience. 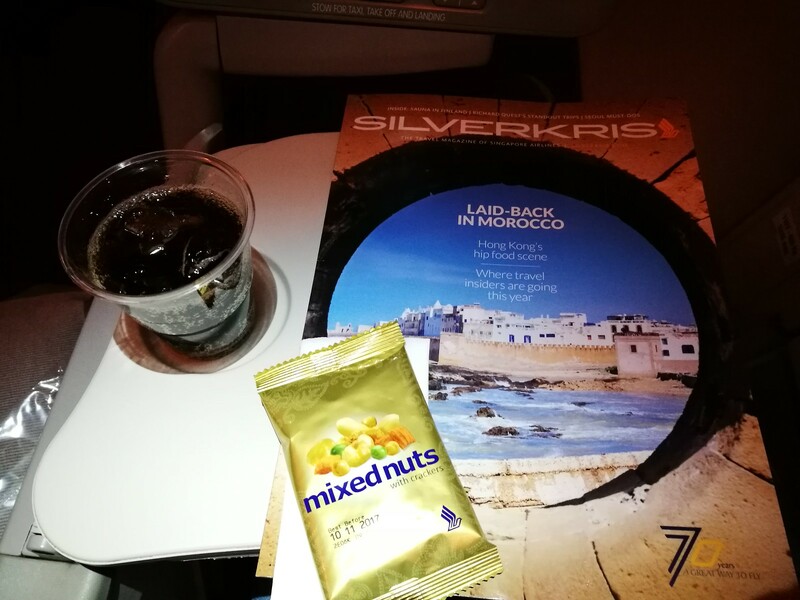 As I started up playing some movies, the crew started the cabin service with distributing mixed nuts and drinks. Having lived in Singapore, I do enjoy the mixed nuts pack which has some spicy crackers inside. These are frequently found as nibbles in the pubs and bars around Singapore as well. I had a Diet Coke to go along with the nuts and I was even able to get extra pack of the nuts from the friendly crew serving the flight today. 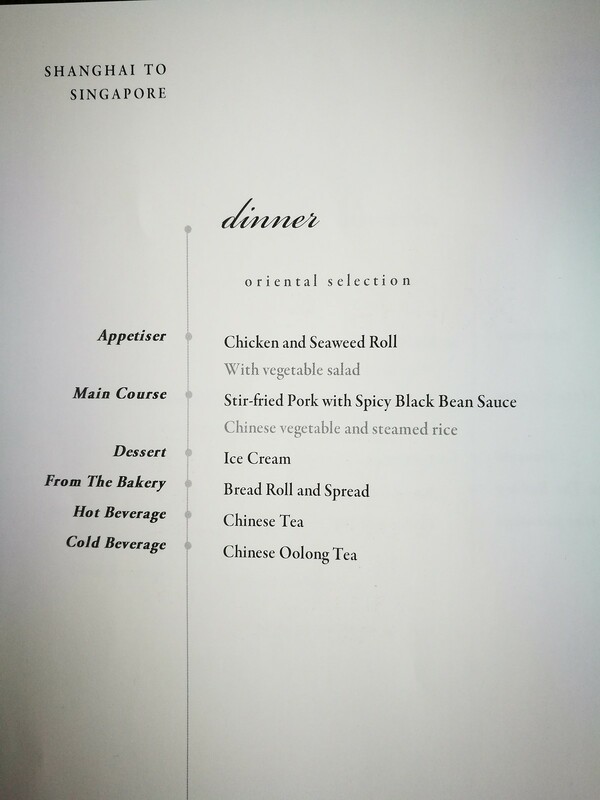 Looking through the inflight menu, Singapore Airlines provides the meal choices for both outbound and inbound flights and it featured the same choices for the Singapore to Shanghai segment with the same ‘Teochew’ food promotion. 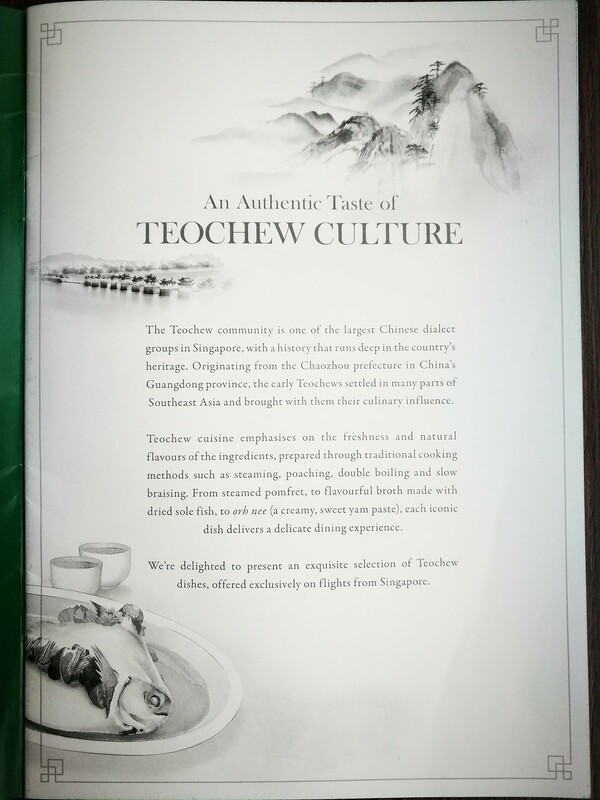 Based on my outbound flight, I was kind of disappointed since authentic Teochew cuisine is nowhere similar. 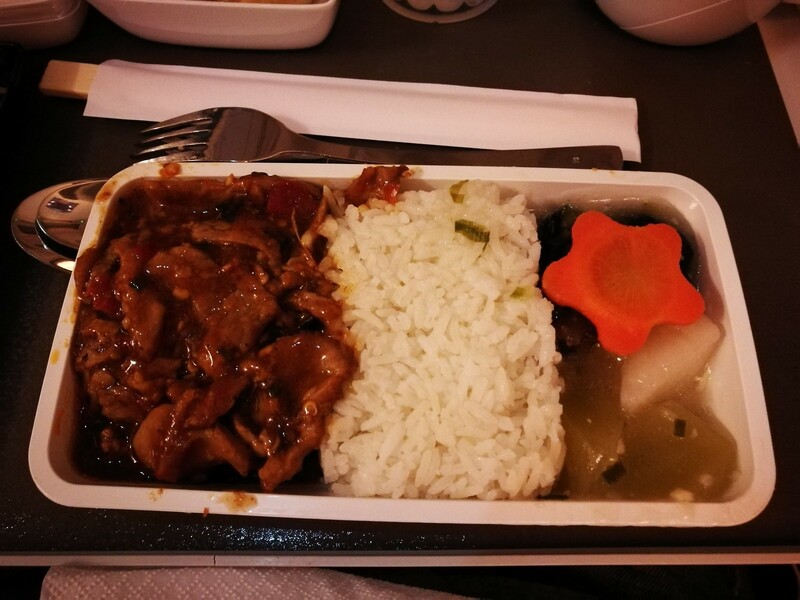 I did however have the Oriental selection of stir-fried pork with black bean sauce served with rice. For a complete set of the menu, please head over to my Flickr album as the menu was also available in Chinese. 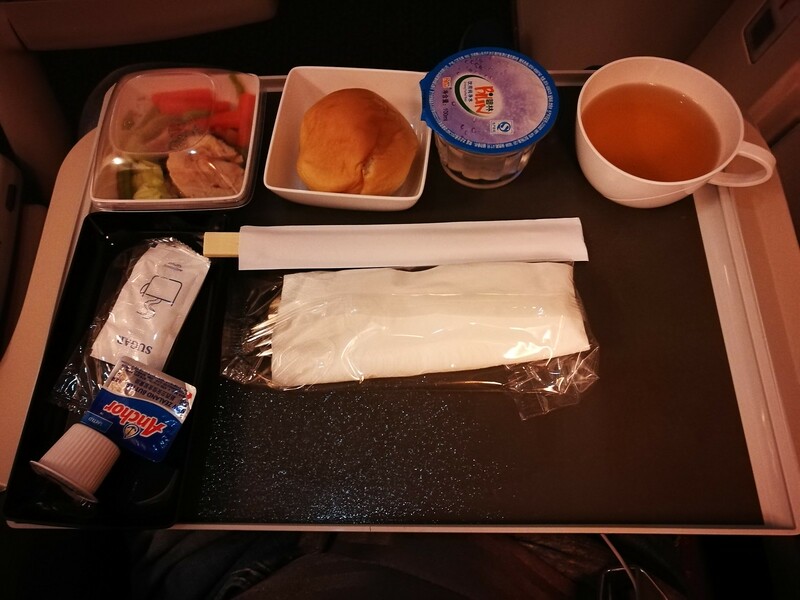 For the meal service, the crew came over and asked passengers what choice they would like to have and the tray without the mains was served first. There was a salad with chicken breast roll on the upper left corner, a bread bun with butter, a small sealed cup of water and another cup for the drinks of your choice. Since I picked the Chinese meal, I went with Jasmine tea for the drinks. 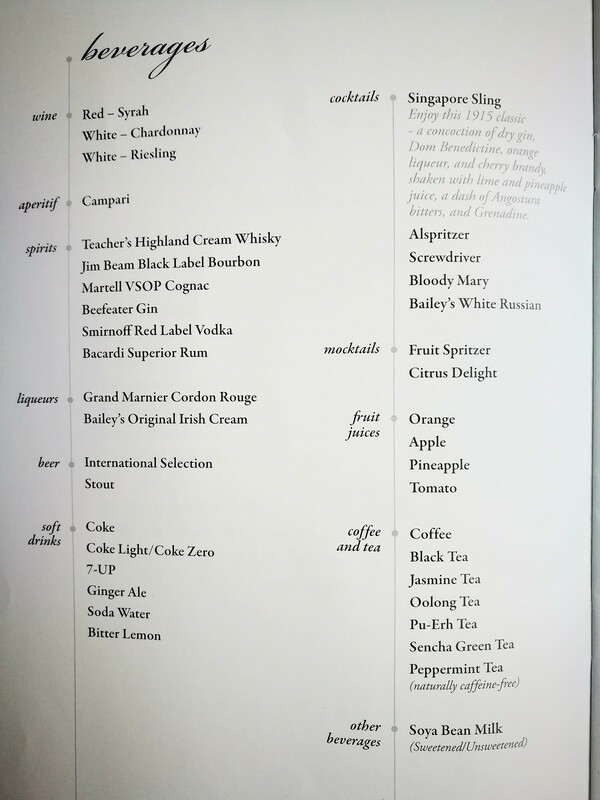 It helps that Singapore Airlines has an impressive drinks list even in Economy Class and that even puts some Business Class drinks menu to shame. The main course was served shortly after and it was steaming hot. I liked it better than the main course I had from Singapore and being a bit hungry I actually found the portion to be a bit small. 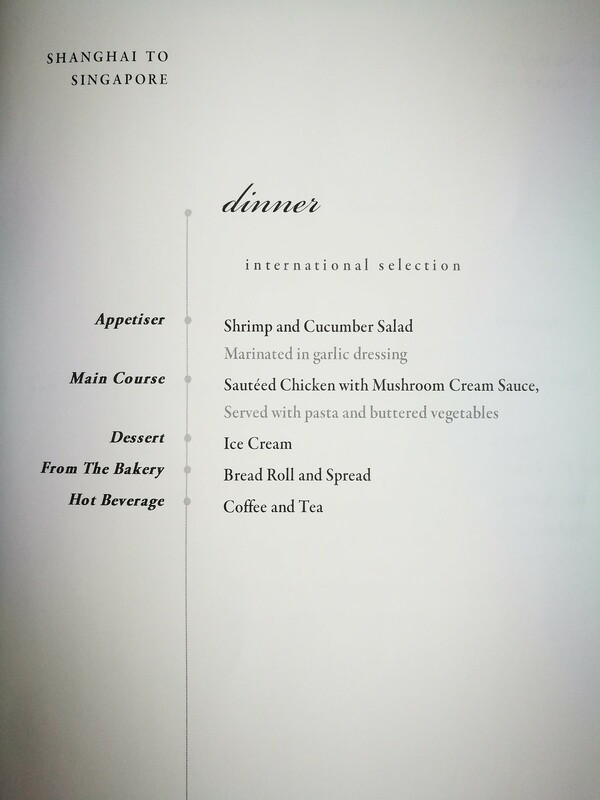 Fortunately, there was still dessert served afterwards and the timing for the meal service was impeccable in Economy Class even with the nearly full cabin. I received the Wall’s Cornetto cone moments after I finished my meal and it was a nice touch to end the cabin service. 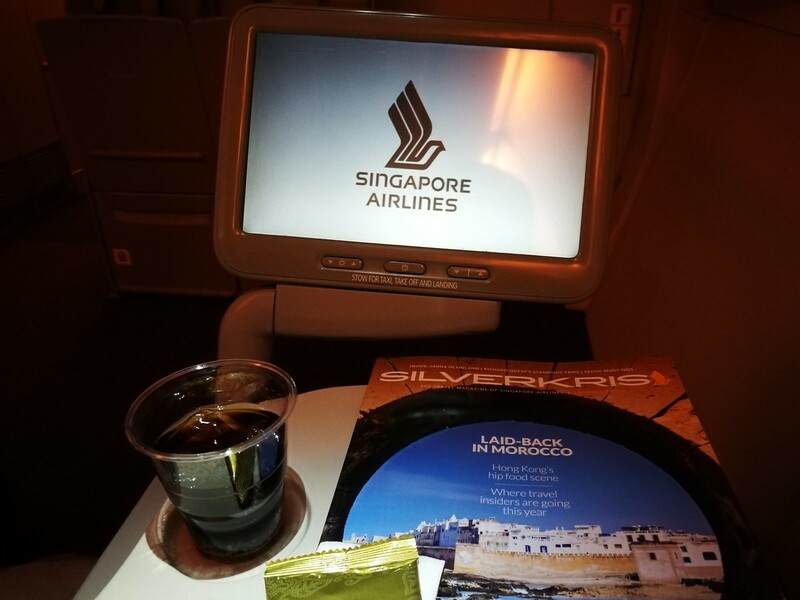 The crew also did a round of coffee and tea offers to passengers and they were generally very cordial and happy to provide a great flying experience. 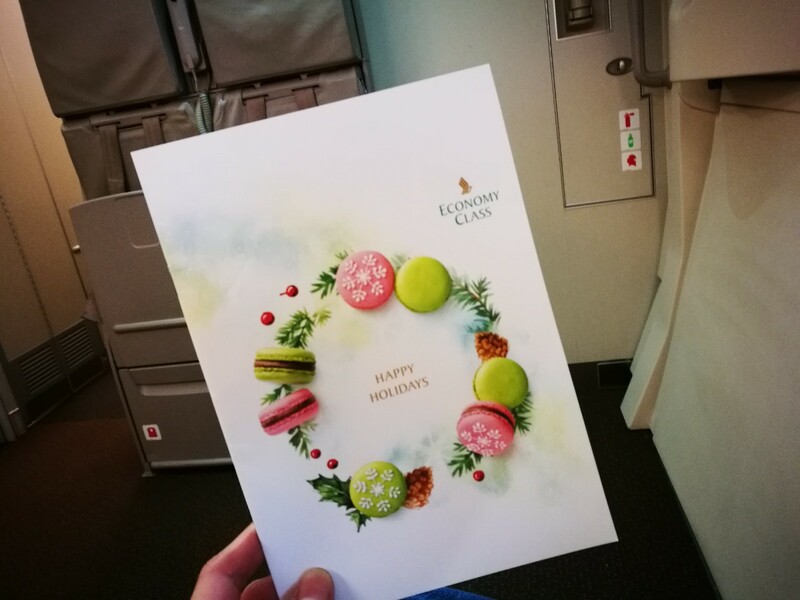 After the meal service, there was another round of drinks offered by the crew about an hour before we were scheduled to land in Singapore and I thought it was a nice touch to do this. Being on the bulkhead seat has its advantages such as the extra legroom but it does have the drawbacks as well. One thing passengers should note is the extra amount of foot traffic around the lavatories. That meant more noise and light if you want to get some rest. 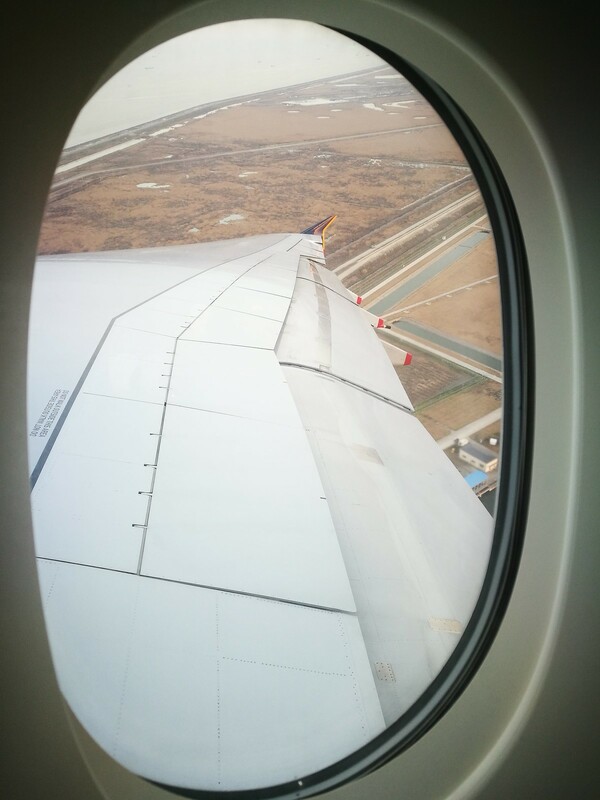 Furthermore the window seat did not offer much of a view due to its location over the wing and the A380 has a huge wing that renders any view to be nearly obsolete. Lastly, across from where I was seated was the jump-seat for the crew and 2 crew members were seated across right there, moments before landing. That meant less privacy and it can be a bit awkward since I do expect most crew members to chat while they are in the jump seat, and that makes you privy to their conversations. In this particular instance, it was a steward and stewardess and I felt like I might a third party, or sort of. 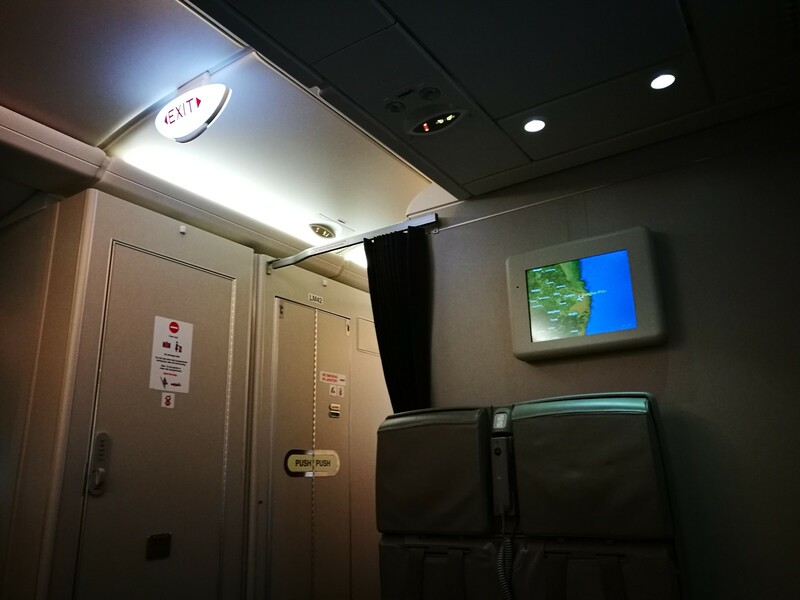 Other than that, this was another nice flight on Economy Class and I still believe that Singapore Airlines offers the best Economy Class flying experience of any airline. They have the most generous seating arrangement, since they are one of the few airlines to have 3-3-3 seating on the 777. And they have some of the best inflight screens to pass long flight times. With this set of crew, the service was even stellar and the soft product was close to what some airlines offer in Business Class. Little wonder then why they price their tickets at a premium. I can only hope that their business model could still last. Thanks for pointing out the mistake, I might have been thinking of the A330 at the time of my posting!